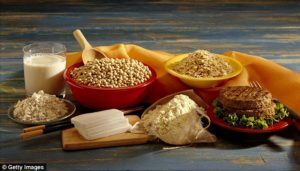 There’s been a long-standing belief that plant-based diet might lack enough protein. This is simply not true. Of course, some plant foods contain significantly more protein than others. 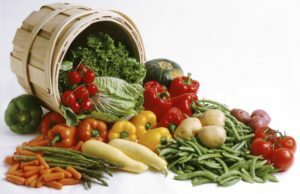 But adopting a balanced and varied plant-based diet can promote muscle strength, endurance, performance and recovery for both top athletes and the occasional gym-goer. Regular daily exercise is not something that should be ignored simply because we are eating the optimal diet for human health and well-being. All research indicates that there are huge health benefits when we regularly raise and maintain a higher heart rate and give our load-bearing muscles a good workout. And this is just naming a few of the horrible health conditions that can benefit greatly from regular exercise. And if we can’t manage this amount every day, we should ensure that we do as much as we possibly can – if possible, take the bike or walk rather than jump in the car; take the stairs rather than the lift; get up regularly from the chair and walk around the house – anything to increase the amount of daily physical movement. I use a Fit-bit wrist monitor to remind me when it’s time to get moving. There are many other products on the market like this to give us a timely tip-off that our muscles and joints would like to “go out and play”! Tofu, tempeh and edamame all derive from soybeans. Soybeans are considered a whole source of protein. This means that they provide the body with all the essential amino acids it needs – which is important for workouts. All three contain iron, calcium and 10-19 grams of protein per 3.5 ounces (100 grams). Edamame are also rich in folate, vitamin K and fibre. Tempeh contains a good amount of probiotics, B vitamins and minerals such as magnesium and phosphorus. At 18 grams of protein per cooked cup (240 ml), lentils are a beneficial source of protein. Lentils also contain decent amounts of slowly digested carbs, and a single cup (240 ml) provides approximately 50% (14 grams) of our recommended daily fibre intake. Further, the type of fibre found in lentils has been shown to feed the good bacteria in our colon, promoting a healthy gut. This type of detoxing allows for better workouts. 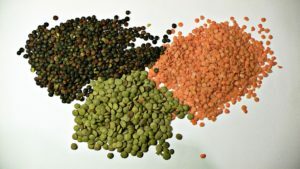 Lentils are rich in folate, manganese and iron. They also contain a decent amount of antioxidants and other health-promoting plant compounds. Chickpeas, also known as garbanzo beans, are also high in protein. Chickpeas contain about 15 grams of protein per cooked cup (240 ml). They are also excellent sources of complex carbs, fibre, iron, folate, phosphorus, potassium, manganese and several beneficial antioxidant compounds. 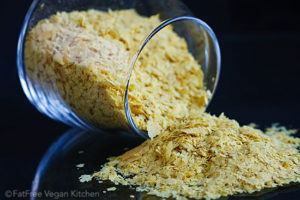 Nutritional yeast is a deactivated strain of Saccharomyces cerevisiae yeast, usually sold as a yellow powder or flakes. This complete source of plant protein provides the body with 14 grams of protein and 7 grams of fibre per ounce (28 grams). And if you consider it is needed, fortified nutritional yeast is also an excellent source of zinc, magnesium, copper, manganese and all the B vitamins, including B12. 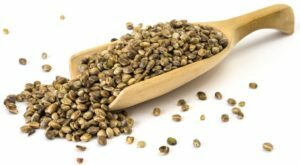 Hemp seeds contain 10 grams of complete, easily digestible protein per ounce (28 grams). That’s 50% more than chia seeds and flaxseeds. Hemp seeds also contain a good amount of magnesium, iron, calcium, zinc and selenium. 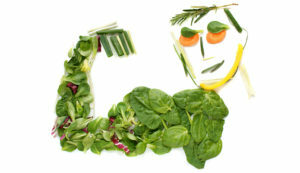 What’s more, they’re a good source of omega-3 and omega-6 fatty acids in the ratio considered optimal for human health. 1 cup (185 grams) of cooked quinoa provides us with 8 grams of complete protein, in addition to covering 30% of our daily requirements of iron, 50% manganese and 39% of our daily copper needs. 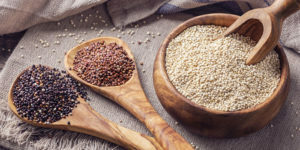 Quinoa also contains decent amounts of fibre (5.2 grams) , magnesium, thiamine, riboflavin, potassium and small amounts of most of the other nutrients our body needs, including essential fatty acids. 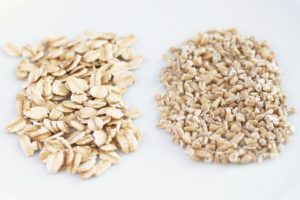 Half a cup (120 ml) of dry oats provides us with approximately 6 grams of protein and 4 grams of fibre. 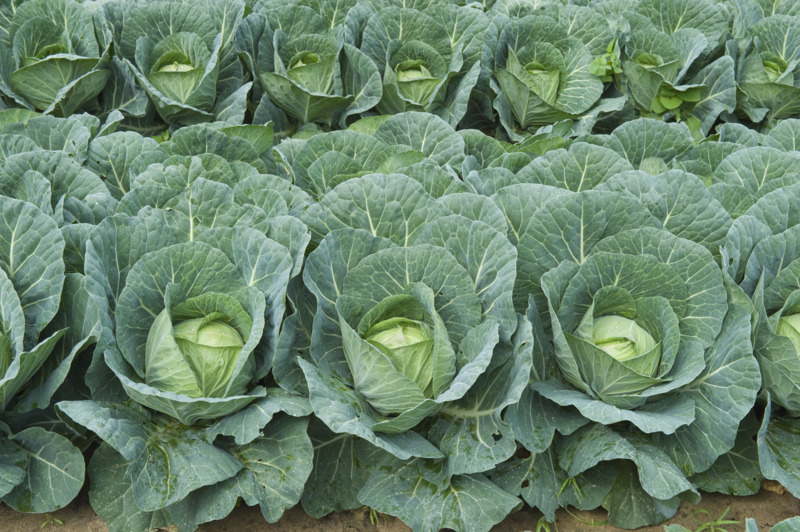 This portion also contains good amounts of magnesium, zinc, phosphorus and folate. Oats are a good pre-workout snack. For the best boost in energy before a hard workout, carbohydrates are easier and faster to digest than foods high in protein and fat. 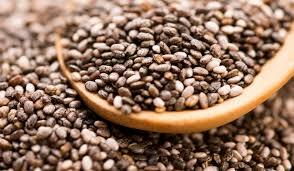 At 6 grams of protein and 13 grams of fibre per 1.25 ounces (35 grams), chia seeds contain a good amount of iron, calcium, selenium and magnesium, as well as omega-3 fatty acids, antioxidants and various other beneficial plant compounds. One ounce (28 grams) contains between 5–7 grams of protein, depending on the nut and seed variety. 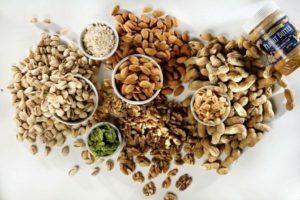 Nuts and seeds are also great sources of fibre and healthy fats, in addition to iron, calcium, magnesium, selenium, phosphorus, vitamin E and certain B vitamins. They also contain antioxidants, amongst other beneficial plant compounds. Add in a little bit of healthy fats before a workout. Try some clementine oranges with a few unsalted nuts. The combination of healthy fats and carbohydrates will help us stay fuelled without weighing us down. 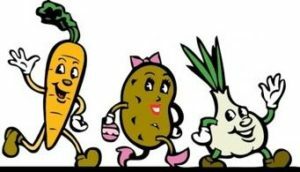 Fresh fruits have a lower protein content than vegetables. They contain approximately 2–4 grams of protein per cup (150 grams). These are great before a workout. 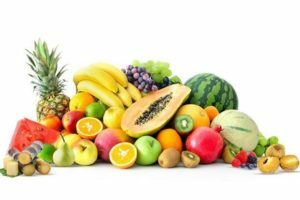 Fruit contains energy-boosting carbohydrates—not to mention satiating fibre and phytochemicals that are easy to digest. They contain about 4–5 grams of protein per cooked cup (approx. 150 grams). Incorporating above-ground leafy vegetables (especially kale) after a workout will help neutralise the acid that’s released. We want to keep our bodies in a state of alkalinity, otherwise the body will leach calcium from the bones to neutralise blood acidity. Physical activity and annual medical outlay in U.S. colorectal, breast and prostate cancer survivors. Yan AF, Wang Y, Ng AV. Prev Med Rep. 2018 Feb 2;9:118-123. doi: 10.1016/j.pmedr.2018.01.003. eCollection 2018 Mar. Simultaneous Aerobic Exercise and Memory Training Program in Older Adults with Subjective Memory Impairments. McEwen SC, Siddarth P, Abedelsater B, Kim Y, Mui W, Wu P, Emerson ND, Lee J, Greenberg S, Shelton T, Kaiser S, Small GW, Merrill DA. J Alzheimers Dis. 2018;62(2):795-806. doi: 10.3233/JAD-170846. Physical exercise prevents cognitive impairment by enhancing hippocampal neuroplasticity and mitochondrial function in doxorubicin-induced chemobrain. Park HS, Kim CJ, Kwak HB, No MH, Heo JW, Kim TW. Neuropharmacology. 2018 Mar 2;133:451-461. doi: 10.1016/j.neuropharm.2018.02.013. [Epub ahead of print] PMID: 29477301. Aerobic Exercise: Evidence for a Direct Brain Effect to Slow Parkinson Disease Progression.Ahlskog JE. Mayo Clin Proc. 2018 Mar;93(3):360-372. doi: 10.1016/j.mayocp.2017.12.015. Review. PMID: 29502566. Benefits of intensive treadmill exercise training on cardiorespiratory function and quality of life in patients with pulmonary hypertension. Chan L, Chin LMK, Kennedy M, Woolstenhulme JG, Nathan SD, Weinstein AA, Connors G, Weir NA, Drinkard B, Lamberti J, Keyser RE. Chest. 2013 Feb 1;143(2):333-343. doi: 10.1378/chest.12-0993. PMID: 22922554 Free PMC Article. A review of lifestyle factors that contribute to important pathways associated with major depression: diet, sleep and exercise. Lopresti AL, Hood SD, Drummond PD. J Affect Disord. 2013 May 15;148(1):12-27. doi: 10.1016/j.jad.2013.01.014. Epub 2013 Feb 14. Review. PMID: 23415826. The effects of exercise on vascular endothelial function in type 2 diabetes: a systematic review and meta-analysis. Lee JH, Lee R, Hwang MH, Hamilton MT, Park Y. Diabetol Metab Syndr. 2018 Mar 6;10:15. doi: 10.1186/s13098-018-0316-7. eCollection 2018. Review. PMID: 29541164 Free Article. Exercise Training and Cardiovascular Health in Cancer Patients. Squires RW, Shultz AM, Herrmann J. Curr Oncol Rep. 2018 Mar 10;20(3):27. doi: 10.1007/s11912-018-0681-2. Review. PMID: 29525828. Previous Previous post: What Will Your Last 10 Years Look Like? Next Next post: Does Prostate Cancer Screening Work?